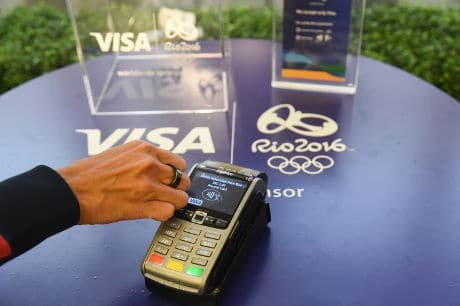 Athletes at this year’s Rio 2016 Olympic and Paralympic Games will be given an NFC payments ring linked to a Visa account that will let them make purchases by tapping their hand against contactless terminals. The rings will be given to all Team Visa athletes, a group of 45 Olympic hopefuls from around the world “who embody Visa’s values of acceptance, partnership and innovation,” the payment network says. “The ring uses the patented NFC Ring design of McLear & Co that includes a secure microchip made by Gemalto with an embedded NFC-enabled antenna, enabling contactless payment capabilities. “Athletes and fans will also be able to use their Visa accounts leading up to and at the Rio Games, using various new form factors,” Visa adds. “From booking and planning their trip using Visa Checkout or making purchases at the games on their mobile phone, both experiences are first-time offerings for Rio 2016. “The Visa ring is a great innovation that I know all the athletes competing in Rio will enjoy as it will be great to go from a competition to purchase without having to carry a wallet or card,” says Team Visa athlete Missy Franklin.